I've used it on one trip so far. Its awesome. The added ability to tie more junk to the sides is perfect. I dig the bright orange tool area as well for any after dark roadside fixes. Overall, its a nicely thought out product. Only thing I would like to see, is a removable/adjustable insert "back pad" where you would normally rest your back, on my sportster the bag sits too far back to be used a back rest, so having that option would be killer. Otherwise, its solid. 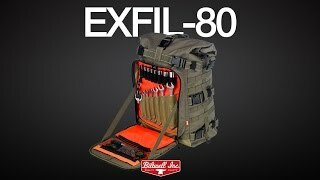 A very versatile bag,has killer storage capacity and mounting points. The bag is very high quality..Im happy with my purchase. The bag is a must when traveling.